Well folks, its that time of year when a lot of gardeners thoughts turn to spring, regardless of the dusting of snow on the ground this morning or Paxutany Phil’s winter prediction tomorrow. In six weeks, it will be time to start planting early root vegetables like potatoes, onions (seed), garlic (if it wasn’t planted last fall), radishes and turnips. (Click here to go to the GIEI calendar for central Maryland. If you are not in central Maryland, click here to go to the dynamic calendar, where you can enter your last frost date and get an adjusted planting calendar). Other vegetables that can be sown or planted in mid-March are peas, fava beans, cabbage (transplants), leaf lettuce and spinach. Late March and early April is a very busy time of year as a lot of cool season root crops like carrots, beets, horseradish (roots), leeks (transplants or seed), onion (sets or transplants), parsnips and shallots (sets) can be put into the garden. Other cool weather crops like broccoli, cauliflower, Brussels sprouts, celeric, celery, collards, head lettuce, parsley (all transplants), kale, kohlrabi, mustard, and Swiss chard (seeds or transplants) can also be planted this time of year. In early spring, a large number of the vegetables we plant are transplants. We can buy these transplants at the local nursery or big box store and take the chance the store will have the variety of vegetable we are looking for or we can grow our own transplants. I prefer to grow my own transplants because it allows me to grow vegetables (like Packman broccoli, Snow Crown cauliflower, and buttercrunch lettuce) I won’t find anywhere and I know do well here in Clarksville. It’s not hard or expensive to grow your own transplants, all you need is your preferred vegetable seed, a fluorescent light fixture, a stand to hold the fixture, seed starting media (think soil-less mix), containers, water and a warm place to germinate the seed. The GIEI website has a lot of information on starting seeds under lights. (click here to go to this information and links to videos on seed starting.) My fluorescent light setup is made up of older, recycled T-12 fixtures. Fluorescent tubes for these fixtures are being phased out in favor of newer, more efficient T-8 tubes which require T-8 fixtures. T-8 fixtures are relatively inexpensive. A four foot, two tube fixture (shop light) costs between $20-$25 and will provide light for two 11 by 22 inch flats, while a four tube fixture (two by four feet) costing about $40 will provide light for four flats. So a PVC stand, two tube fixture and fluorescent tubes will cost around $50. This may seem expensive, but remember that two flats of transplants can cost $30 and that these lights will allow you to raise transplant for many years in the future. Fluorescent tubes for your fixtures should have a light output of at least 2500 lumens (a measure of total amount of visible light) and can be (in the case of a two tube fixture) two cool white, a warm and cool white or grow light tubes. After seeds germinate, lights need to be lowered to within one to two inches above the transplant’s foliage. As transplants grow, the lights will need to be raised. This photo is of my insulated light box. The insulation helps retain the heat given off by the fluorescent fixtures. It provides warmer conditions for those transplants that need them, like tomatoes, eggplants and peppers. Each type of vegetable seed has an optimal germination and growing temperature. 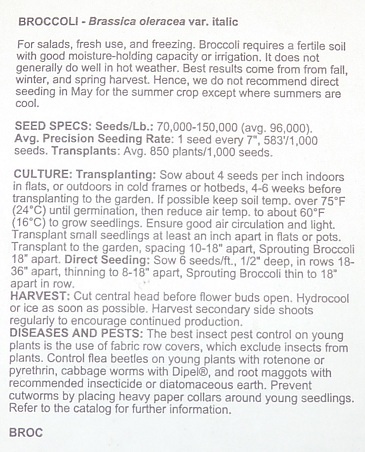 Information on these temperatures, days to germination, planting depth and number of weeks to grow transplants from seed to transplantable size can usually be found on the back of the seed packet or in a good seed catalog like Johnny’s Selected Seeds. The temperature of your soil-less media will impact the amount of time it takes to germinate the seed. The temperature of the growing media can be controlled using a seedling heating mat and a thermostat. The thermostat will have a probe which is placed in the media and will regulate the heating mat to keep the media at the desired temperature. So now that we have our lights, seeding mat and thermostat set up and information on how to start seeds and grow transplants from the seed packet, let’s review the planning and steps necessary to start some broccoli seeds for transplant into the garden on April 1. The first step is to determine when to plant broccoli seeds. Since we want to put our transplants in the garden on April 1 and we know from the seed packet that it take approximately six weeks to grow the transplants from seeds to transplantable size, I simply work backward on the calendar from my plant outside date to determine my seed planting date, which would be February 18. Next, when the seed planting date rolls around, I moisten the media in which I’m going to plant the seeds and fill the containers. The container I use to start my broccoli is an insert made up of 32 two and a quarter inch square cells. I place this insert in a flat and loosely fill the cell with soil-less mix. I bump the flat on a hard surface to settle the media and sow the seed at the recommended depth found on the seed packet. I then label the flat with the type of seed and date of planting, wet down the media using a sprayer or sprinkling of water and cover the flat with a plastic flat cover or sheet of plastic suspended over the flat using plant labels and tied around the flat with string or rubber bands. Next, it’s onto the seedling heating mat, set the thermostat for 75 degrees, insert the probe into the media and place the flat under lights. Depending on the viability of the seed and germinating conditions, broccoli takes from 4 to 7 days to germinate. Once most of the seeds have germinated, remove the flat cover and seedling mat, lower the height of your fluorescent fixture until the tubes are about one to two inches above the top of the seedlings and lower the temperature to around 60 degrees (optimal temperature for growing broccoli transplants). Lowering the temperature at which the seedling are grown will cause stockier growth and create hardier transplants. Check the seedlings daily, watering the seedling when the media feels dry to the touch and raising the lights when necessary. After about two to three week, water with a half strength liquid fertilizer solution. At five weeks, it’s time to harden off the seedlings by introducing them to outside conditions. 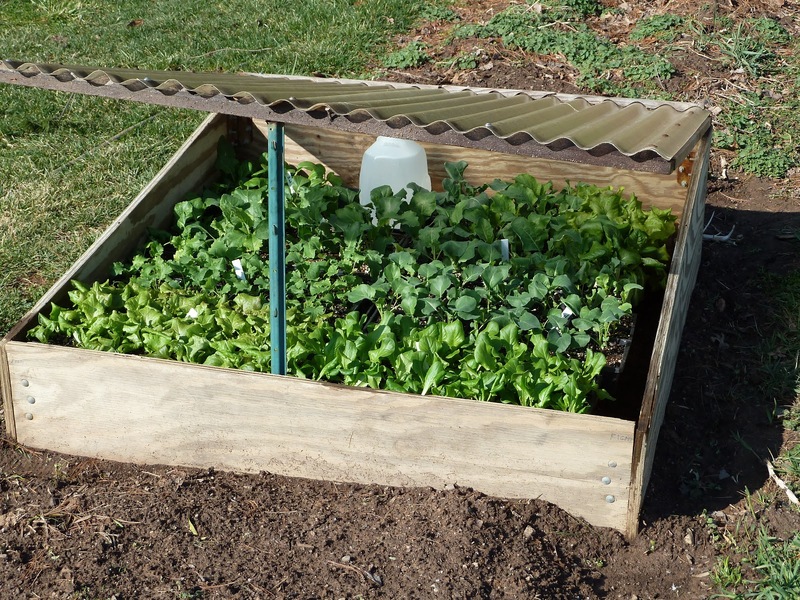 In my garden, I use a cold frame to protect tender seedlings and harden them off. On cold windy days and at night, I lower the top to protect the seedlings. On nice days, I leave it propped open as shown in the above photo. If you don’t have a cold frame, introduce your seedling to the outdoors gradually by placing them in a sheltered place out of direct sun and wind for the first couple of days and then moving them into less sheltered area with more sun. For a full discussion on hardening off, click here or here. And don’t let your transplants dry out. After about a week of hardening off, your transplants can be planted in the garden. Plant them at the same depth that they are growing in the container and water them in with a half strength water soluble fertilizer solution. In late March and early April, I place wire hoops over my raised beds and cover my transplants with row cover. This protects my early broccoli, cauliflower, cabbage and kohlrabi seedlings from pests and provides an extra four degrees of temperature protection from fickle spring frosts. I use my fluorescent lights starting in early February through late July to early August. I raise transplants for initial planting in spring and summer as well as for succession planting during the summer and fall. For example, I know that squash vine bores will get my early planting of zucchini so when I take the row cover of the zucchini so that they can be pollinated, I’ll start a set of replacement transplants in four inch pots under lights. In June, I’ll start some broccoli, cauliflower and collard seeds for planting sometime in early August. 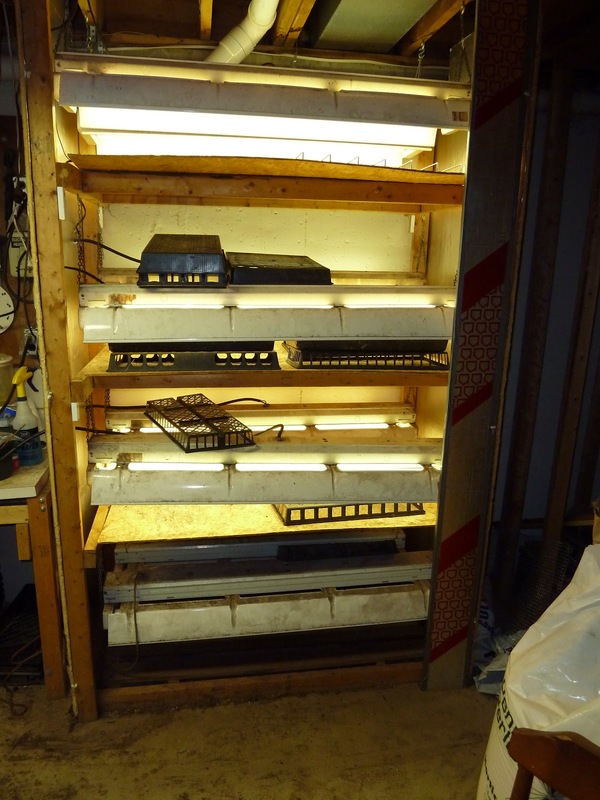 So, if your interested in growing transplants for vegetable varieties you select and maximizing the use of your garden by having succession transplants ready to go into the garden when space becomes available, get a couple of T-8 fluorescent fixtures and start growing. Great article, but wanted to ad that there are also T5 fluorescent light fixtures and they are even more efficient thatn T8 bulbs!